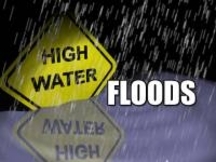 ZANESVILLE, Ohio – The updates continue as the Muskingum County Emergency Management Agency checks for flooding changes. EMA Director Jeff Jadwin spent the morning checking the river and monitoring water levels. He says everything North of the Y-Bridge is still rising and everything South of the Y-Bridge is now down. The areas that are further away from the river are the areas that have cleared up. Jadwin says as long as we get a couple dry days, the river will continue to go down but there is still some ice out there and areas to be cautious around. Some of the debris that he saw were tree branches and logs.